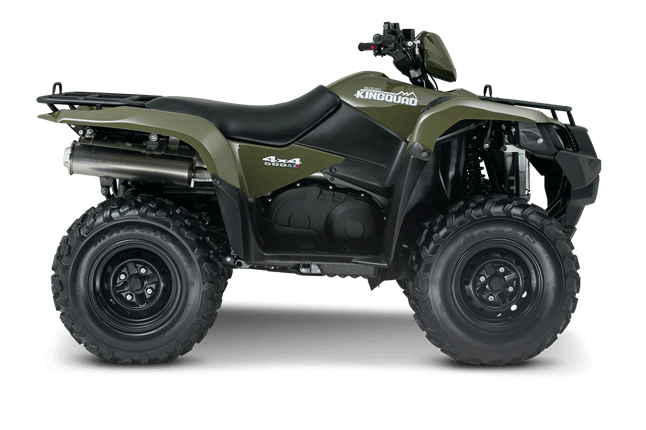 The rugged and reliable KingQuad 500AXi receives a few new changes that provides smoother acceleration, quicker throttle response, and a stronger feel in the mid-high RPM range. The front end of the quad gets a newer aggressive stance while side panel change allows you to easily check your oil level without removing any body parts. 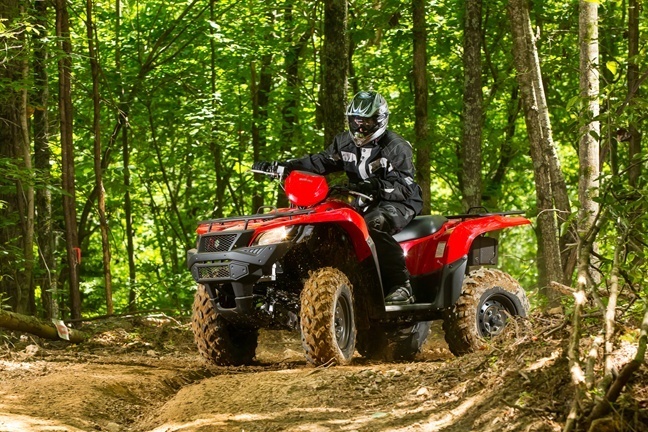 Over three decades, Suzuki literally invented the 4-wheel ATV. The Original Suzuki LT-125 established Suzuki as the First On 4-Wheels. The Suzuki KingQuad 500AXi carries on the tradition of performance that rules. 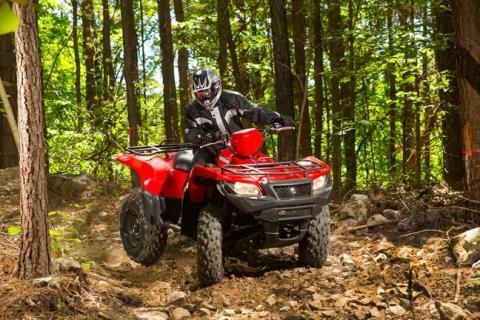 Boasting the same advanced technology as the extraordinary KingQuad 750AXi, it's engineered to help you cut the work day down to size - or conquer the toughest trails. The KingQuad 500AXi offers plenty of class-leading features and its fuel-injected 493cc engine gives it exceptional performance. Independent front and rear suspension. A QuadMaticTM CVT-type automatic transmission, locking front differential and a host of other impressive features place the KingQuad 500AXi at the front of the pack. A powerful 493 cc, SOHC, single-cylinder, liquid-cooled, four-stroke engine was designed to produce a wide powerband with strong top-end power. Its cylinder is canted forward for a lower center of gravity resulting in reduced engine height and lower seat height. The engine also features a counterbalancer shaft for smooth operation. 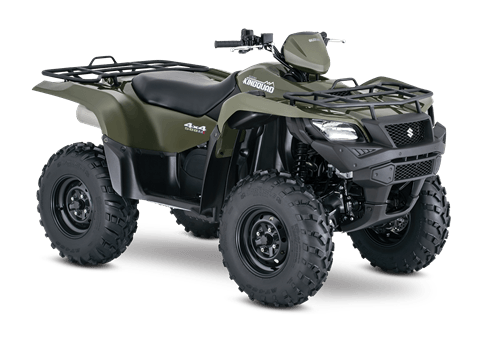 The KingQuad 500AXi has a compact 4-valve cylinder head with large intake valves and straight intake ports for superb cylinder charging efficiency. A sportbike-derived chain-and-gear camshaft drive system allows a short/narrow cylinder head design and reduced overall engine height. A high capacity aluminum radiator with large diameter, thermostatically controlled cooling fan provides stable engine operating temperature. 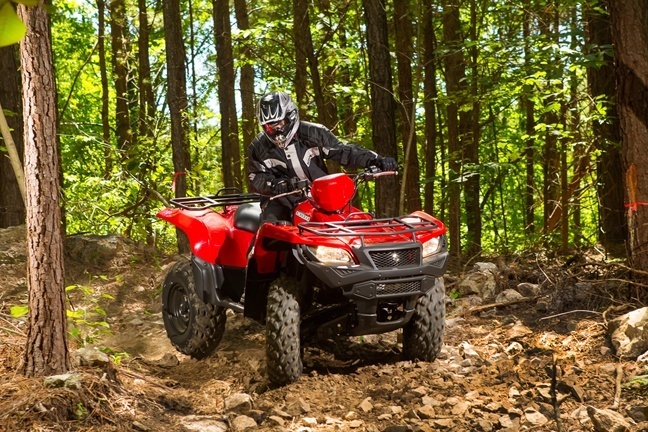 The KingQuad 500AXi comes with a QuadMatic™ CVT-type automatic transmission designed for maximum versatility and convenience with a fender-mounted gate-type shifter operation for high/low range and reverse selection. Its advanced engine-braking system minimizes free-wheeling with the throttle off and helps control the vehicle during steep descents. A convenient handlebar-mounted push-button controls allow the rider to easily select between 2WD, 4WD and differential-lock 4WD to get the right setting for any traction condition. An override switch on the left handlebar control can be used to override the normal speed limiter when stuck in the mud. 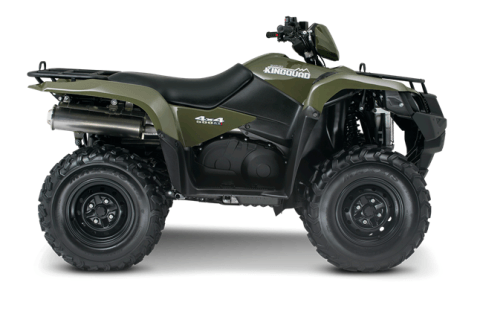 The KingQuad 500AXi comes with a large 4.6 gallon (17.5 L) fuel tank, positioned for a low center-of-gravity. It includes a vacuum-operated petcock, ratchet-style fuel cap and convenient bar-type fuel gauge. 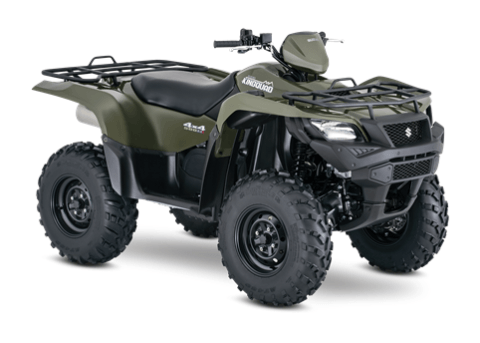 A wide array of Suzuki Genuine Accessories are available for the KingQuad 500AXi, including winches, utility windshield, front and rear bumpers, snow plow, aluminum skid pans, rack extensions, utility box and much more.